We will place ordering links on this page should you determine what you need. We will also add dimensional info. Pricing as shown on the Series 700 page is also shown below. Complete color selections are found on the two color information pages. There are 8 corner shelf choices, all available in approx. 100 colors. Three sizes, the jumbo will come with or without the hook, then mounting choices of flat back or thin-set. The BA765 large shelf above (bottom left) is shown as tiered on one side. You have the option to mount this side up or DOWN. The other side of the shelf is flat. The small and jumbo shelves are smooth on both sides, either side can be mounted as the top side. NOTE: sizes are called SMALL, LARGE, and JUMBO. The large shelf is considered the normal size. This is the Jumbo corner shelf with the hook, model 781, shown in C256 fawn beige. The BF (flat back) shelves look just like the thin-set shelves that were shown first. Yet the BF764 is about 3/4" smaller than the BA764. The BA thin-set mount: Must set into a 5/16" deep or slightly greater depth inlay, on both walls of the corner. It is called thin-set mounting, not recessed. Only the protrusion on the back of the shelf fits into the slots in your tile or wall surface. Your shelf will attach to the same wall surface that the tile is attaching to. And it can be applied using the same waterproof adhesive. The 5/16" projection on the back is not the full size of the back. Measurements per shelf size will be listed later on the page. The BF flat back mount : Designed to be glued onto ANY flat surface. Glue them over tile, stone, greenboard, or sheet rock. Flat back does not require the same inlay opening as thin-set. Flat back is great as an afterthought mounting. You can add a corner shelf to the wall without having to chisel out any tiles. It saves you time, and saves a lot of muscle work. And with a quality waterproof adhesive, their mount is just as strong as the thin set. Lightly sanding a slick tile surface before installing can help with adhesion. On this picture and the one that preceded it, you can see on the BA780 and BA765 shelves that the thin-set protrusion extends and wraps the full corner. On the BA764 small shelf, it stops short of the corner. So on the large and jumbo shelves, you will want to cut the slots in your tile on at least one wall about 1/4" longer so you can push-shift it into place. With flat back mounting, that is not a concern. Remember, you are setting the shelf into two slots simultaneously. If the slots are cut to length to the exact length of the protrusion on the back of the shelf, you will not get it into both slots. You are going to need a minimum of 1/8", but better off close to 1/4" longer on just one wall. A couple more views of the jumbo corner shelf with a hook. BA765 and BF765 are 6-5/8" x 6-5/8" sides, 2-3/8" tall, and 7-1/2" from corner to drip groove. BA780 and BF780 are 8-1/4" x 8-1/4" sides, 2-5/8" tall, and 9-1/4" from corner to drip groove. BA781 and BF781 are 8-5/16" x 8-5/16" sides, 2-5/8" tall, and 9-1/4" from corner to drip groove. 3-1/4" hook height on underside of shelf. Sizes can vary by 1/16" to 3/16" depending upon kiln firing and clay density. If you are contemplating which size of shelf or shelves to put in your shower or tub, we have a simple trick you can do prior to ordering. You see the dimensions listed above. Get yourself a few pieces of cardboard and cut quarter circles out of the cardboard in the above dimensions. Then hold those in your shower or tub corner. The corner shelf should be of sufficient size for what you want to place on it. You do not want it too larger or too small. Your aim is "just right." We will say that the jumbo corner shelves are quite popular. They give you a lot of space to set things upon. Select from the part numbers written just above. Prices are shown in those blocks of text too. PLEASE WATCH which mounting method you select. Mounting methods were described higher up on this page. Remember to complete your part numbers with the color code of your choice. All corner shelves are available in about 120 colors. You can view colors at this page when you need to see them. There is also a color by number cross reference chart. So when ordering, enter the part number such as ACP-BA780-C70. The # symbol was replaced with the color code C70 for biscuit in this example. Corner shelves coordinate with all the other bathroom hardware. In the 700 Series all items come in all colors and in any quantity that you like. And anyone can purchase from us. All the corner shelves except the Jumbo with the hook can mount with either side up. Obviously the Jumbo with the hook has to mount hook side down. If you run into your two wall surfaces in your shower or tub not being perpendicular, just hope that they are not too far off. The corner shelves do have a right angle on them. They are meant to be glued evenly on both wall surfaces. And if your corner is off by 1 to 4 degrees, you are not in bad shape. Extra adhesive behind the shelf, shimming out the corner with a layer of mortar, and a slightly wider caulking bead to mask the gap are steps you can take to hide the out of squareness. But if your walls are badly out of square, a corner shelf might not work for you. We know about this because a handful of customers over the years have told us about their situations. If replacing a shelf that became broken in your shower or tub area, and thin set mount, you will need to chisel or grind out all the old residue of the broken shelf. 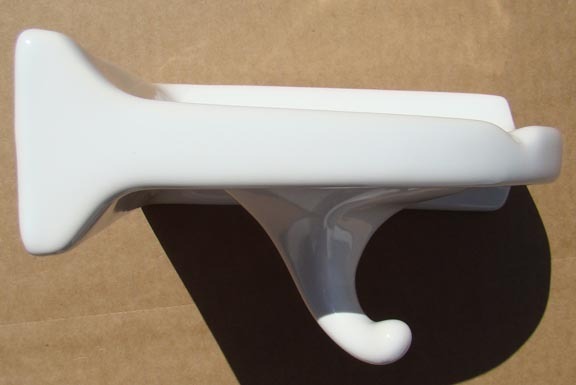 You might have to increase the size of your tile slots for the replacement shelf as there have been many producers of ceramic and porcelain bath hardware over the past 100 years. There are all kinds of sizes of corner shelves out there in older homes. A few photos of what you can place on the corner shelves. 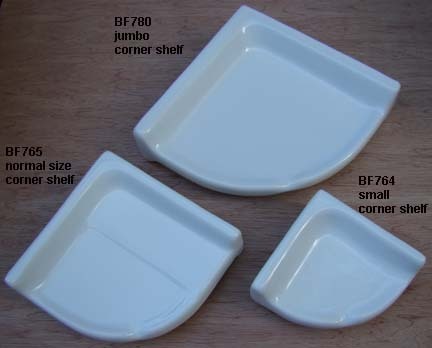 The BA765 and BF765 large corner shelves are tiered on one side only. Either side of the shelf can be mounted as your top side. Gives you a nice option.